After 3 days of staying ashore due to rough sea conditions, we were finally able to get back on the water. We set out towards the southwest corner aboard the Salacia this afternoon and were delighted to find a humpback whale named Sundown. Sundown was initially making about 5 minute dives possibly subsurface feeding. Twice she came up within about 10 feet of the boat as we waited idly for her at the surface. 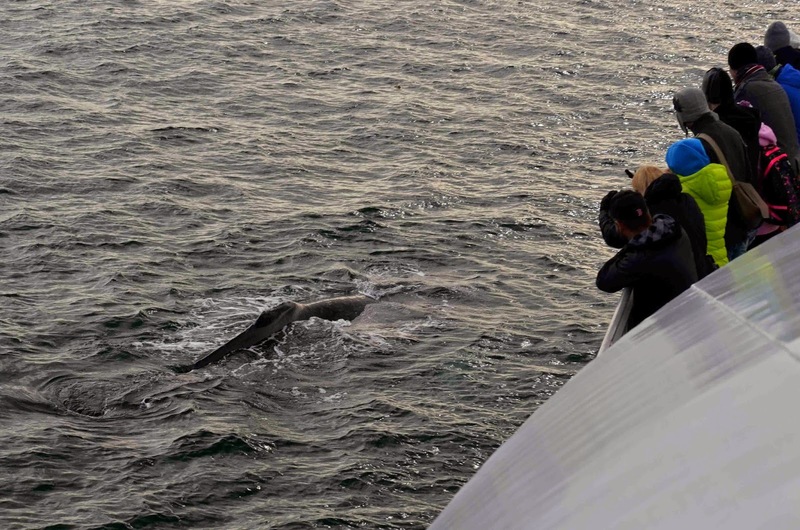 The second time she surfaced, she started lob-tailing right off our bow giving guests a fantastic show. Sundown then started traveling south. We stayed with her for a few surfaces until we turned back for Boston. 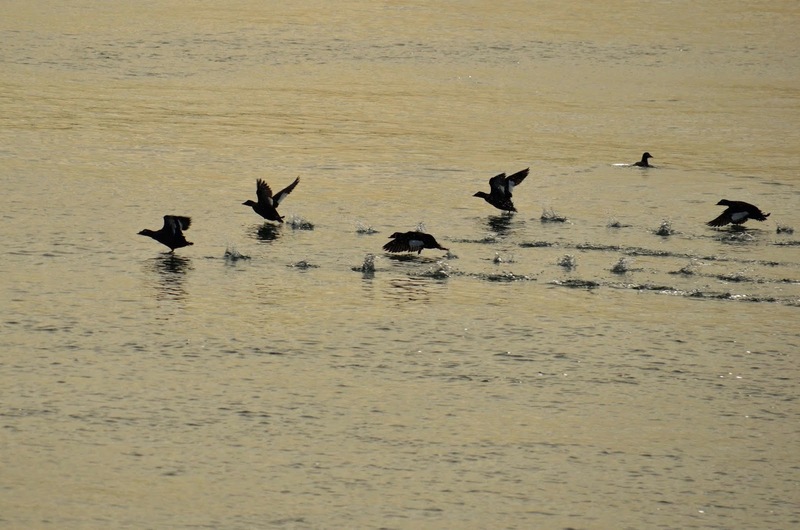 We sighted thousands of birds out on the water today including surf scoters, white-winged scoters, eiders, cormorants, gannets, loons, great shearwaters and various gull species among others. There were quite a number of fishing vessels on the southwest corner today, too. Two trawlers which appeared to be cooperatively pair trawling were particularly close to Sundown which gave us a bit of concern (see photo). While Stellwagen Bank is a national marine sanctuary, fishing is still allowed. Dragging, however, is prohibited. These two trawlers were likely mid-water trawling. 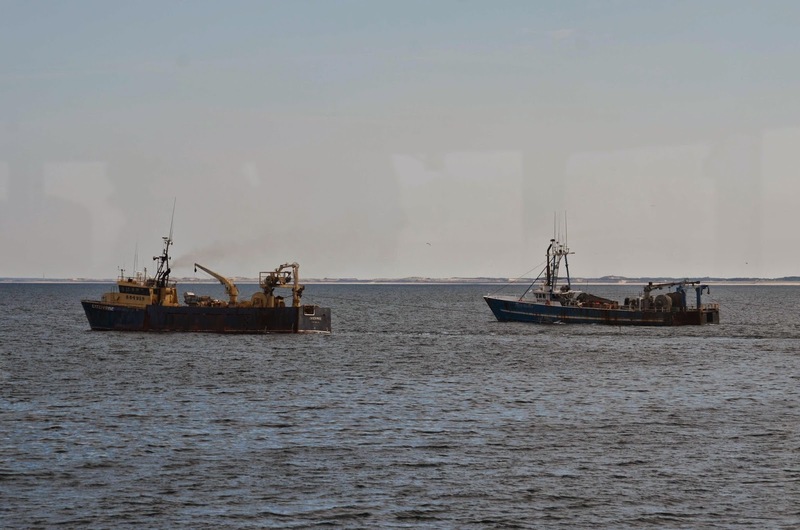 Even though these vessels were actively fishing very close to Sundown, they statistically pose much less of a threat to whales than the large amount of fixed gear in Massachusetts Bay. Even so, seeing these active fishing vessels with such large nets in the water reminded us of the many threats these whales face every day. 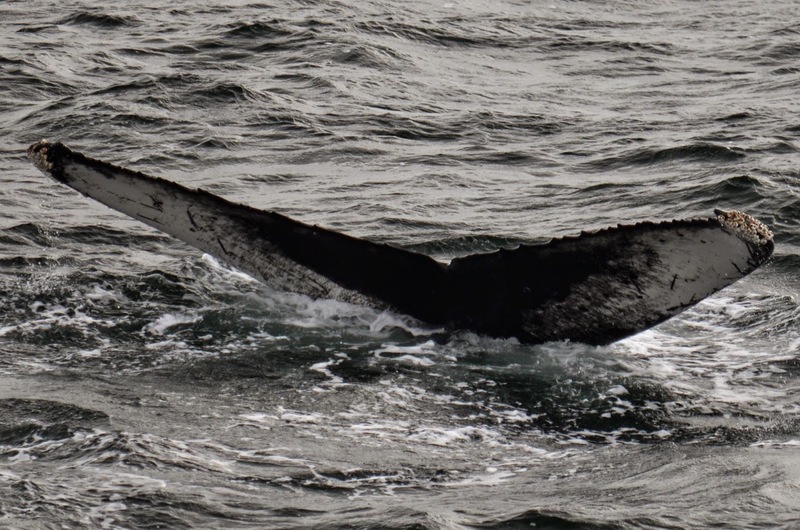 I wanted to follow up with an recent unknown humpback, whom we have since IDed with the help of folks over at Center for Coastal Studies (thank you!). Our unknown T3 fluke turned out to be that of Boomerang’s 2012 calf. We were not readily able to ID this whale because the markings on this juvenile’s fluke have changed so drastically. 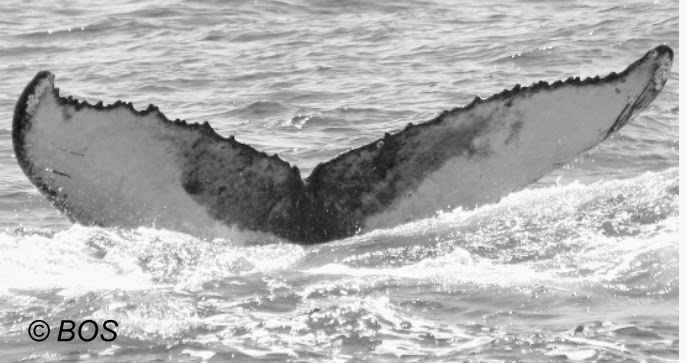 This transformation is typical of juvenile humpbacks. You can see from the fluke photos, one taken in 2012 when the whale was a calf (photo credit to Blue Ocean Society and Center for Coastal Studies 2013 GOM humpback catalog), the other taken Friday, the dramatic changes that have occurred in the markings on this juvenile’s fluke. These changes can make it difficult for the scientific community to recognize and track young whales from year to year. For this reason, it’s important for us to have (close to) a continuous photographic record of these whales’ flukes as they evolve from season to season. 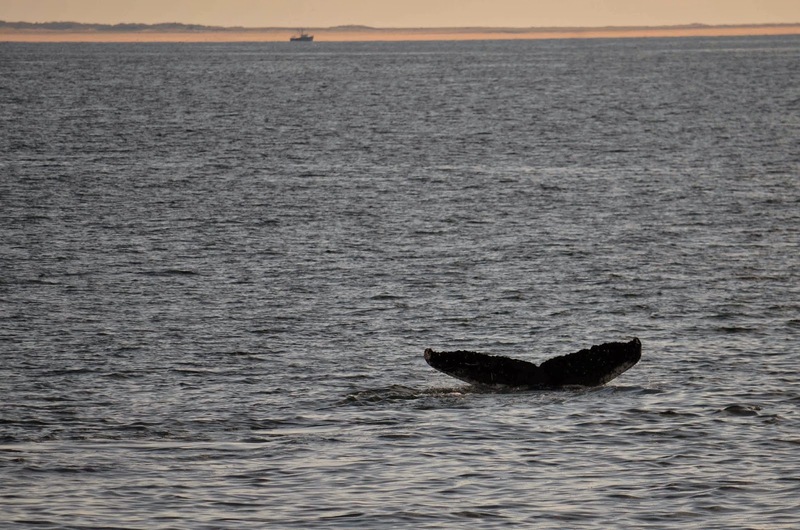 The hard work, collaboration and photo sharing among many organizations throughout Massachusetts Bay and the Gulf of Maine is what allows researchers to track such a large number of whales year after year. As one of the largest whale watching organizations in Massachusetts, we are proud to contribute to this team effort every day.